Cryptic dying words from a murdered homeless woman in present day San Francisco unlock a decades-buried secret that changed history. Now a pair of ruthless assassins are sent to cut the few living "loose ends." And a young, resourceful woman on the run encounters a determined man with his own connected past and vengeful agenda. Forced to partner for survival and answers, a fast-paced and deadly game of cat and mouse ensues, taking them across the globe from the winding streets of Paris to the faded palaces of Budapest to the frozen lakes of Mongolia...where destiny, passion, and further betrayal await them. The Altar of Bones has it all: The Russian mob. KGB spies. Presidential assasination. A doomed Hollywood legend. Deathbed confessions. Corrosive power. Shattered families. Guardians of an ancient religious icon housing a secret others will kill to possess. The dark promise of immortality. And it delivers on its ambitious premise to leave you stunned and breathless at the end. 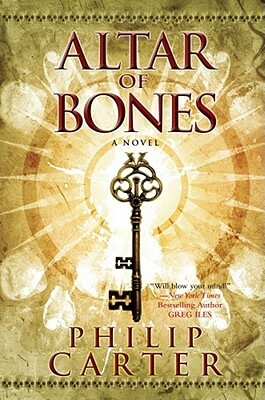 Philip Carter is a pseudonym for an internationally renowned author.